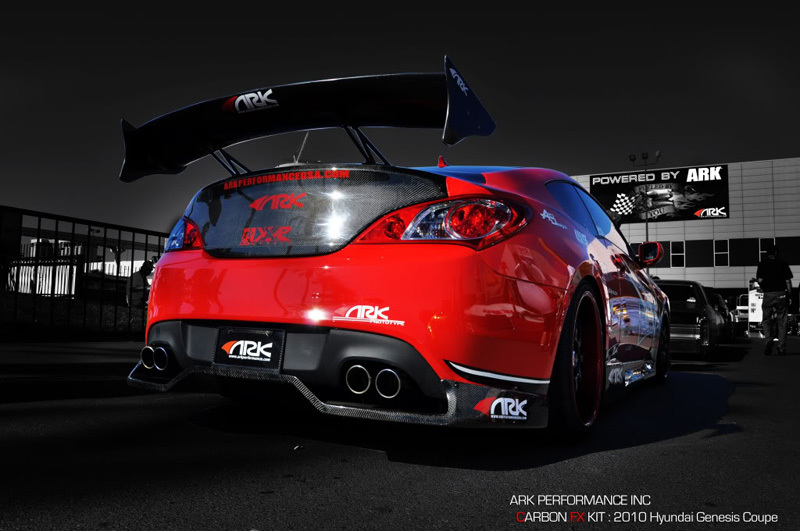 ARK Performance's aero-style lip kit for the 2010 Genesis Coupe brings an exclusive feel and unique styling. Available in high-quality fiberglass or carbon fiber materials, now you can completely customize your Genesis Coupe and transform it into an aggressively-styled road warrior. Available parts includes: front lip (FRP or CF), Sideskirts (FRP or CF), Rear Diffuser (CF only) and Front Grill (FRP or CF). These parts all bolt directly to the OEM bumpers or side panels--no modification is necessary. The rear diffuser is a full functional part which provides downforce to the rear of the car. This aids in keeping the rear tires stuck to the road during intense driving. The front grill is also functional in that it routes air directly into the intake.